BLAMELESS Review | Warped Factor - Words in the Key of Geek. 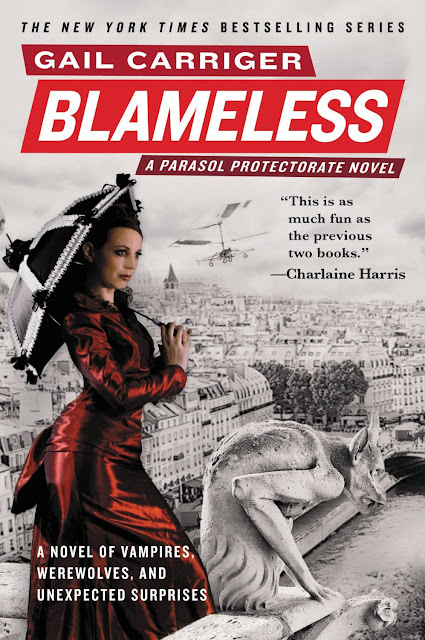 Matthew Kresal reviews the third Parasol Protectorate novel. 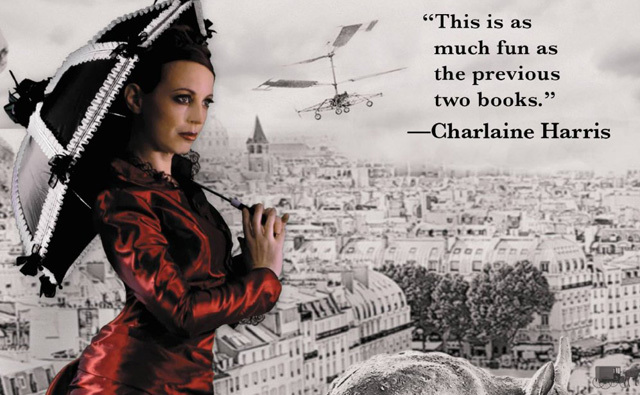 Gail Carriger's Parasol Protectorate series has made for interesting reading since a good friend suggested the series to me last fall. Having recently read the second novel Changeless and been left with its cliffhanger ending, I found myself wanting to know what happened next. So much so that, in a rarity for me when reading a series, I picked the next volume up straight away. How was it though? Talking about Blameless is difficult without potentially spoiling the ending of the previous book. Suffice to say that Blameless picks up very soon after the surprising ending of that volume and sees Alexia setting off in search of answers that will take her across Europe. Meanwhile those events have left their mark on the Woolsey Pack and Lord Maccon with Professor Lyall having to pick up the slack. Nominally the novel is about a series of mysteries involving Alexia's status as a “soulless” preternatural, vampires in London, disappearances and the larger ramifications of this supernatural steampunk world. What perhaps makes these books standout from others in the steampunk field are its characters and wit. Even after the ending of the previous volume, both are present and correct here. Alexia is undeniable herself with her reactions both to her new situation and where it leads her feeling completely in character. Indeed all the returning characters from Lord Maccon to Professor Lyall, Lord Akeldama and Madame Lefoux are all present and correct. What's interesting about this volume in fact is what it does with the characters and how it develops them, not just with Alexia but with supporting characters across the board. Add on the trademark wit of the series and it makes for very pleasant reading. Like Changeless, much of the novel is about world building. Having begun to hint at both the larger role supernatural beings had played in the history of this world, Carriger takes Alexia and the reader out into it. We journey to France and Italy, taking in Paris and Florence as they exist in this universe which leads to some neat moments as famous and familiar places are given a whole new spin. Not only that but it shows us the extent of the steampunk influence across the world including a couple of nice action set pieces during the French portions of the story. This novel, more than either of the previous volumes, also starts exploring the mechanics and history of the supernatural creatures that populate this world, and that plays a big role in this volume especially. All told, it's a nice expansion on what the previous two books had built upon. Yet I have the same overall complaint about Blameless as I did about Changeless: the plot. While the pacing is good given its 355 page run, it occurred to be yet again that in terms of actual plot not much actually seems to happen for often chapters at a time. In doing the sizable amount of world building and necessary exposition in this volume, it becomes dominated by those things. Like many an alternate history work before it, Blameless becomes almost weighed down by the need to explain itself and the central mysteries at the heart of the narrative seem to hover in the background most of the time before rather suddenly being explained (or in one case partially explained) in the last 25-30 pages. The balance between world building and plot seems to be off at times, but the plot and characters do help to compensate. Despite ongoing plot issues, the Parasol Protectorate series is well served by this volume. Carriger's wit and characters are ever present and even though it weighs the narrative down at times, the world building she does presents an intriguing expansion as it takes Alexia and us on the road. The result will likely please fans of the series and leave them wanting to pick up the next volume.